Up to 59%* can be saved when you book a package deal on Expedia. La Gran Plaza Shopping Mall is the perfect place to go if you're a bit peckish. Follow the delicious smells to the food court and you'll be chowing down a meal in no time! Travellers in this destination are spoilt for choice. There's nothing more refreshing than the sounds of ocean waves breaking along the shore. Roll out a picnic rug, stretch out and let your soul be soothed at Linda Beach. Still got some time to spare? You never know what treasures could wash up on the shoreline at Langosta Beach. Take off your shoes and wander along the water to see if you stumble across a message in a bottle. 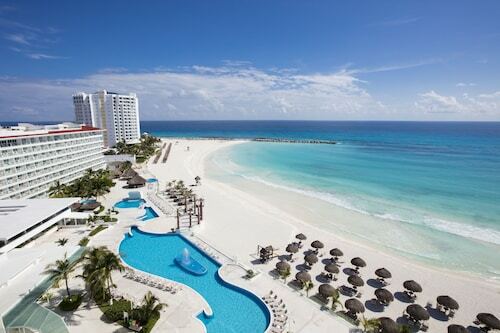 While Cancun does have around 165 accommodations to choose from, it's always smart to book a room beforehand. Not quite sure where to start? Expedia is here to help out with your cheap holiday or luxury getaway. When you're feeling jet lagged, there's nothing nicer than relaxing in a fancy room and spoiling yourself with some room service. See what mouthwatering meals await you at the Family Ocean Villas All Inclusive By Omni Cancun (Boulevard Kukulcan KM 16.5) or the Le Blanc Spa Resort All Inclusive Adults Only (Boulevard Kukulcan Km 10). Alternatively, the Grand Park Royal Cancun Caribe All Inclusive (Boulevard Kukulkan Km 10.5) and the Hotel Avenida Cancun (Av. José López Portillo Mza-14 Lote-2) are a couple of accommodations worth considering if you're travelling on the cheap. 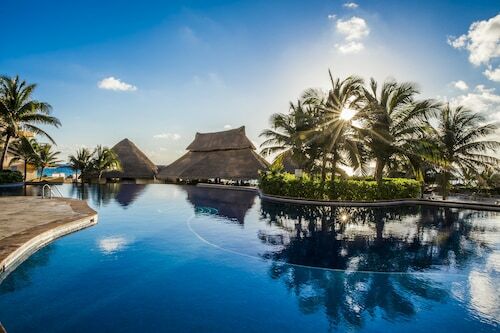 Nestled on the beach, this Zona Hotelera hotel is within a 15-minute walk of Aquaworld and Maya Cancun Museum. Delfines Beach and El Rey Ruins are also within 2 miles (3 km). 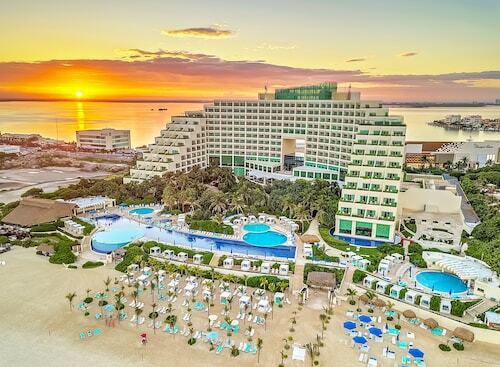 Located in Zona Hotelera, this beachfront resort is in the entertainment district and within 3 mi (5 km) of Cancun Interactive Aquarium and La Isla Shopping Mall. Aquaworld and El Rey Ruins are also within 6 mi (10 km). Nestled on the beach, this Zona Hotelera resort is within a 15-minute walk of Delfines Beach, El Rey Ruins and Maya Cancun Museum. Aquaworld is 1.3 mi (2 km) away. This family-friendly Cancun resort is located in Zona Hotelera, within 1 mi (2 km) of Ballenas Beach, Aquaworld and Delfines Beach. El Rey Ruins and Maya Cancun Museum are also within 2 miles (3 km). 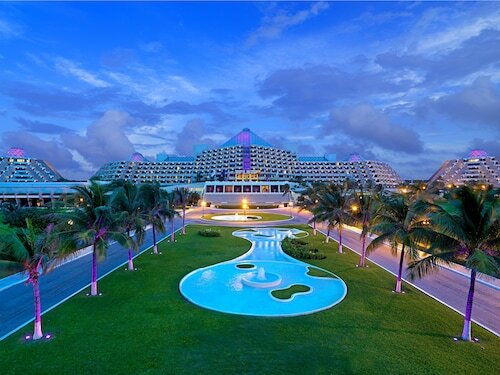 Nestled on the beach, this Zona Hotelera hotel is just steps away from Tequila Museum and Cancun Interactive Aquarium. La Isla Shopping Mall and Aquaworld are also within 2 miles (3 km). Nestled on the beach, this Zona Hotelera resort is within a 15-minute walk of Delfines Beach, El Rey Ruins and Maya Cancun Museum. Aquaworld is 1.2 mi (2 km) away. 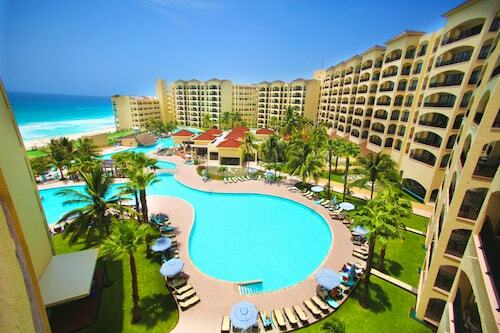 Located in Zona Hotelera, this family-friendly Cancun resort is within a 5-minute walk of Ballenas Beach and Aquaworld. 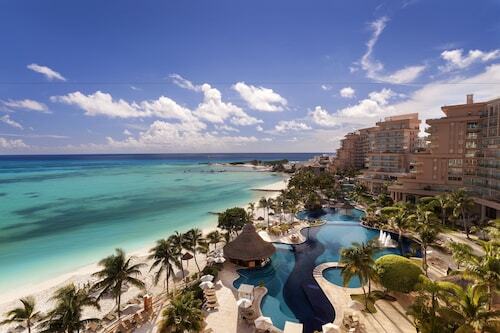 Delfines Beach and Maya Cancun Museum are also within 2 miles (3 km).